This important task should be done before your region experiences cold temperatures. If the words “frozen pipes” draw fear into your very core, you’ll want to know how to winterize your exterior faucets. Many parts of our country experience below freezing winter temperatures and smart homeowners make it part of their fall routine to insulate or cover their exterior faucets as well as empty out the water. Knowing that frozen pipes are often an expensive (not to mention inconvenient) problem, homes built in colder regions often insulate plumbing during the building process. But homes built in warmer regions, that might only occasionally experience cold snaps, are often the victim of frozen pipes. These homes may not be built for the cold, and homeowners may be “caught” with a sudden temperature drop that causes pipes and faucets to freeze, tear and leak. Regardless of where you live, winterizing your exterior faucets might need to be part of your regular fall routine. Here are some tips for winterizing your exterior faucets. Your first step towards winterizing your exterior faucets is to remove all attached hoses, drain them and store them away. If you have a sloped yard or driveway simply lay the hose out straight and let the water drain out. Any water sitting inside the garden hoses could freeze and damage the material. Curl the hose and keep it under the eaves or in the garage or garden shed for the winter. This is a great time to gather up all watering equipment and tools, clean them off and store them out of the way. once the water is cleared, turn off the exterior faucet (close the valve) and close the drain cap inside the house. This will ensure that the exterior faucet has no water sitting inside the sillcock or hose bib. If your home does not have an internal shut off valve then you’ll want to make sure that the exterior faucet has no dripping water. Even a slow drip can add up to nearly 3,000 gallons of wasted water each year. In the winter this drip can easily freeze and block the hose bib. 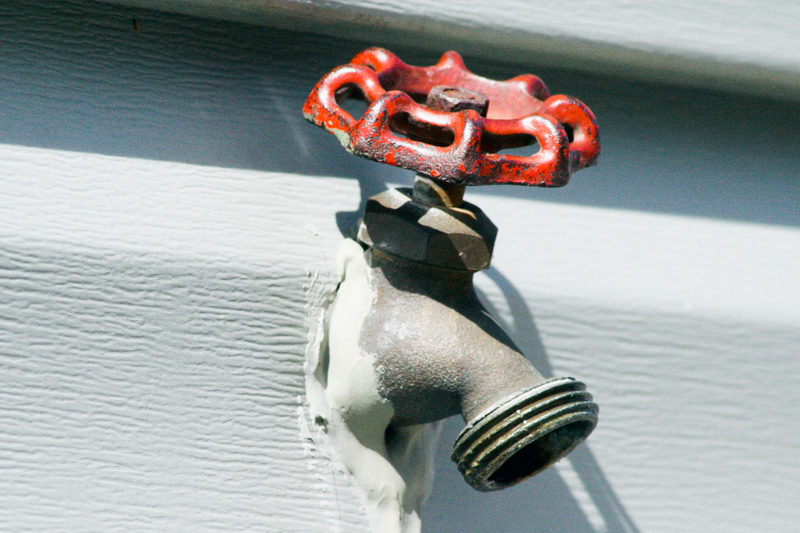 Covering and insulating the exterior faucet can help protect any water inside the pipes from freezing in the winter. Exposed pipes should be wrapped with easy-to-install insulation tubes; find these at your local hardware store. Faucets, or hose bibs, can be fitted with an inexpensive insulated slip-on cover. Some plumbers feel that the inexpensive foam covers aren’t adequate for extremely cold temperatures. In fact, if your region receives extremely cold air and below-freezing wind temperatures, a simple insulated cover may not protect the faucets from freezing. A professional plumber would likely recommend an internal shut off valve to adequately drain the water from the sillcock. If you choose to use an insulated cover, purchase one that is designed to stay on securely during the winter and annually inspect it to ensure there are no tears or damage. Most of us think that it’s the expanding ice inside the pipe that makes the pipe burst but actually it’s caused by an increase in water pressure. According to the Insurance Institute for Business and Home Safety, the continual expansion from the frozen water creates not only a blockage in the pipe, it increases the water pressure between the blockage and the closed valve “downstream.” In fact, the burst or break in the pipe actually occurs not where the ice is but where the extreme water pressure build-up occurs. You’ll know if a pipe is frozen if you turn on a faucet, or flush a toilet, and no water comes out (or just a trickle comes out). Unfortunately, when it comes to exterior faucets (that are generally not used all winter long) homeowners aren’t aware of an ice blockage until the weather warms up; the ice inside the pipes (which was acting like a plug) melts, and the water starts to flow out of the tear in the pipe. Water damage can be very expensive, especially if it damages flooring, electronics or valuable goods. The best course of action is to properly winterize faucets, pipes and plumbing (don’t forget exposed pipes in the attic, basement or garage) and minimize the potential for a burst pipe.